Cops or the policemen have their own aura around them owing to their discipline and righteous behaviour. I always wanted to become a cop and serve my nation. There are very few sites that can help you look like a cop in seconds and photomica.com is one of them. 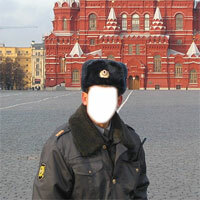 You can become a cop now by using the Police photo face in hole effect from our site. Just upload a photo of yours and edit it using our photo editor. Adjust your face in the given hole and save the picture on your PC. Show it to your friends telling them that you have joined police now and be careful now onwards when they want to deal with you!